The bitter cold air of today will transition to a milder air mass this weekend and that transition will include some snow as low pressure moves quickly in a west-to-east fashion. The snow will be more significant across the Ohio Valley late tonight and Friday and some higher elevation spots in West Virginia could see several inches. The system will tend to weaken some, however, as it moves into the Mid-Atlantic region on Friday and any accumulation is likely to be minor on the order of a coating to an inch or two. The area most likely to get the snow is the corridor from DC-to-Philly with New York City likely too far north. The snow may start in the early-to-mid morning hours in the DC metro region and late morning/mid-day in Philly and it should wind down during the afternoon. One final note of caution, although this will be a relatively minor snow event, ground-level temperatures have been very cold recently so any snow will likely stick quite quickly on all untreated surfaces and even treated surfaces as salt is less effective. A warming trend will begin this weekend in the Mid-Atlantic region with 30’s possible for highs on Saturday and 40’s on Sunday. By Monday, high temperatures should reach the 50’s in the DC-to-Philly-to-NYC corridor and those above-normal temperatures will continue through mid-week. On Thursday, a cold front will be approaching from the northwest and its eventual passage will usher in a return to cold weather by the end of next week. Numerous daily, monthly low temperature records were set again this morning in the Upper Midwest and there were at least three all-time low temperature records: 1) Moline, IL at -33°F, Rockford, IL at -30°F and Volk, WI at -35°F. 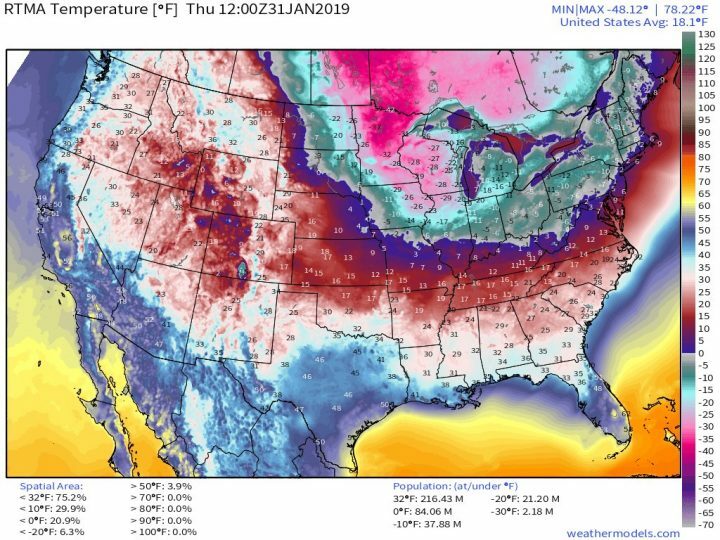 Chicago, Illinois did not break their all-time record low of -27°F set in January 1985, but it came within three degrees on Wednesday morning by bottoming out at -24°F. The official low temperature this morning at Chicago was -21°F. This shatters the previous record for Jan 31st, which was -12°F set back 1985. In records that date back to the 1870’s, this is only the 15th time Chicago has seen a daily low this cold or colder, yesterday was 14th. The state of Illinois may have set their all-time low temperature record as the Mt. Carroll coop site reported a low of -38°F this morning. The all-time record low for the state of Illinois is (or was) -36°F set in Congerville on January 5, 1999. The state of Minnesota came very close to their all-time low temperature record with a low of -56°F in Cotton. This fell 4 degrees short of matching the all-time low for the state of -60°F set in 1996. The bitter cold will ease in the Upper Midwest after today. In the eastern US, many records were set on Wednesday and Thursday and the table (above) has a listing of some of those confirmed by the National Weather Service.